Can height affect athletic performance? Because of my height, my hopes of ever playing in the NBA or NFL were thrown out the window fairly early in my life. But this got me thinking, does height have any effect on your athletic performance, or can someone that’s 5 feet tall be just as athletic as some that’s 6 feet tall? The null hypothesis in this situation is that height has no effect on athletic performance. The alternative hypothesis is that height does effect athletic performance, meaning being taller wither gives you an advantage or a disadvantage over shorter people in athletic performance. There are multiple third variables that we have to be aware of when looking into the topic, such as type of athletic event, and what you would use to define athletic performance. Speed is a crucial aspect of any athletic event, so are short people slower? You would think that stride length would have a big impact on speed, and in a way it does, but only after you reach a certain speed. It turns out, up to a certain speed, we all have around the same stride frequency. There was a study that was conducted in Italy about this very subject, where they collected data from a sample of 51 children ages 2-16, and then compared the findings with previously known data of adults. The researchers found that up to eleven kilometers per hour (8:45 mile pace), our stride frequency were very similar, and the frequency only began to change after you went of the set pace. In a separate study, researchers looked into the relationship between muscle fatigue and arm length/height. The researchers gave each subject 3 attempts at a bench press where the were told to hold the weight at a certain height in order to produce muscle fatigue in the subjects. With a p-value of 0.02, it was found that there was less muscle fatigue in people with smaller arm spans than those with larger arm spans. On average, men are slightly taller than women, so when we compare the difference between the heights of their vertical jump, we can get a vague idea of the relationship between height of a person and the height of their vertical jump. On average, the mean vertical jump height for men 22.1 inches with a standard deviation (give or take) of plus/minus 3/4 inches, while the mean female vertical jump height is 14.1 inches and the standard deviation is plus/minus 2.5 inches. From this data, we can conclude that on average, there is a positive correlation between the height of a person and the height of their vertical leap. Although, we need to consider the possible third variables due to the use of gender comparisons and not the direct effect of height. After these findings, we can reject the null hypothesis that there is no relationship between height and athletic performance. Although there is not always a negative relationship, there is undoubtedly one in general. This entry was posted in Uncategorized on October 21, 2016 by Corbin Kennedy Miller. I do not think height is everything. My younger brother is in the eighth grade and is 6’3 , which is a crazy height for someone his age. I see him next to his friends and the difference height is comical. He is an exceptional athlete for his age also. He is thirteen and was practicing with the varsity football team over the summer. On the other hand, my step brother is also very tall but not athletic at all. He is 6’6 and cannot catch a ball to save his life. He is kind of awkward and does not know how to handle his body. I think height definitely helps, but just because you are tall does not make you a gifted athlete. Great job on the article overall! I loved how you were able to make a correlation and carry out the study. From my own personal experience, Athletic ability comes from genetics and hard work. I can find an athlete who is 5 feet and has a great work ethic, compared to a 6 foot athlete who does not work hard, it is all about the effort that they put into it. Being a 5 foot 6 athlete I liked reading this article. I 100% agree with the concept, my own personal story growing up I have always been the most athletic in all my activities. They don’t affect you as much when you are younger but the older you get things start to change. Once you hit high school and everyone hits their growth spurts i noticed a lot of my friends that I have always been more athletic then start to get more college attention then I did. This points back to the point on height has no affect on athletic ability but does in fact impact the advantages you have during play. Most top tier schools have all players that are bigger and stronger so to create a even playing atmosphere schools recruit players that are in fact bigger to give them a good advantage. Being a 5 foot 6 athlete I loved reading this article. I 100% agree with the concept, my own personal story growing up I have always been the most athletic in all my activities. They don’t affect you as much when you are younger but the older you get things start to change. Once you hit high school and everyone hits their growth spurts i noticed a lot of my friends that I have always been more athletic then start to get more college attention then I did. This points back to the point on height has no affect on athletic ability but does in fact impact the advantages you have during play. Most top tier schools have all players that are bigger and stronger so to create a even playing atmosphere schools recruit players that are in fact bigger to give them a good advantage. This post one on of my favorite ones! 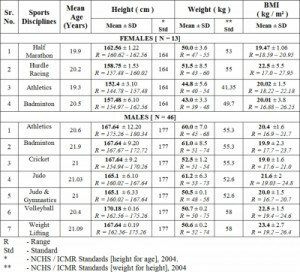 i enjoyed the fact that you found studies based the correlation between height and performances in sports. Although their was no direct correlation I do agree with the results in the study. There have been multiple professional athletes that have be much smaller than average but preformed with amazing skill and talent. Muggsy Bogues was a professional NBA player who stood at five feet and three inches. Check out is career stats, his height was no factor in his performance. Do you think height is just consider a benefit for athletes? Or is there a y variable that connects height and performance together? I think that a person’s athleticism comes from a combination of third variables instead of just on height. For example I play rugby and in rugby there is a position for 6’7 240lb tanks, as well as nimble 5’9 180lb guys. Many of the thing that one might see in a person that might lead to the description of them being athletic are actually genetic traits. Here is an interesting article on whether elite athletes are born or made. I loved reading this post because in high school I was a three sport athlete, and always one of the shortest on all my teams. On my basketball team I would get so aggrevated when the older girls on my team were getting all the rebounds, but then I didnt let that stop me. I realized because I was shorter I could jump higher and run faster. Each height has a different perk and ability and you just have to find yours! A short athlete can be just as fast as a tall athlete! 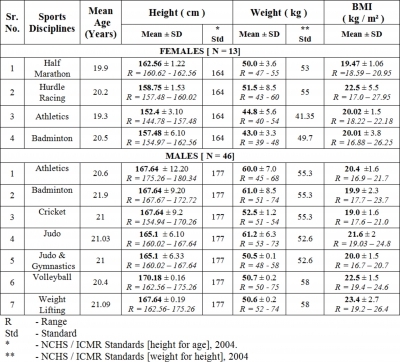 Here is another article on height affecting athletes in sports!